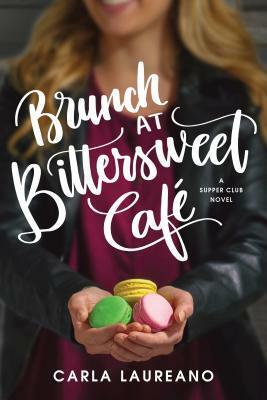 Brunch at Bittersweet Café was my first book by this author. After reading it, I want to read the first book in the series - The Saturday Night Supper Club. This book can be read as a standalone with no confusion. The series is about three friends and each book features a different friend. This book was about Melody who was a baker and pastry chef. She wasn't using her skills at her current job as a bread maker and her classical French training is being wasted at a mediocre chain bakery. She wants to have her own bakery and when her beloved grandmother leaves her money in her will, she and her best friend Rachel, decide to open a restaurant together. At the same time, Melody - who has also been unlucky in love - meets Justin - a pilot who is getting ready to relocate to Florida. This sets up a painful decision - should she follow her heart and move to Florida with Justin or follow her dream and start a new restaurant with Rachel. I would classify this book as women's fiction with some Christian fiction mixed in. It's a story about love and friendship and making good choices in life. The description of some of the pastries that Melody bakes are so well done that they will either make you hungry or ready to pull out your baking pans and make a sumptuous dessert.